The IAB report does not release data on pricing, but the Accordant data, which also includes some non-Internet forms of RTB, such as digital out-of-home, indicates the expanding supply of exchange-based impressions is putting a damper on average costs — at least for the time being. In other words, demand is expected to begin catching up with supply over the next 12 months. 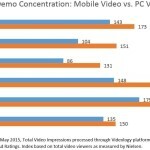 On a positive note for the overall display advertising marketplace, the Accordant study also found that “ad placement transparency” — or data disclosing the “viewability” of ads served to users — improved “significantly,” growing to 41% of all impressions served during the first quarter of 2013, from only 32% in the fourth quarter of 2012. Accordant Media is an independent, real-time media-buying (RTB) and optimization specialist that makes audience targeting and biddable display media simpler and more effective for leading agencies and brand marketers. Accordant’s one-stop, turnkey service, helps marketers achieve targeted, efficient advertising in a repeatable and scalable manner across paid display, video, mobile and search media. In a new era of cross-channel, exchange-traded media, Accordant’s innovative custom audience segmentation engine, Audience Optics(TM) , exploits micro-segmentation, finely sculpted audience insights and dynamic inventory management to produce higher ROI and customer engagement/response rates. This is done with any non-PII data set, without restrictions, helping clients gain access to dynamic inventory sources and deliver more targeted, relevant messages with 100% transparency. Co-founded by digital agency execs Art Muldoon and Matt Greitzer, Accordant Media is based in New York City.